Minoo Moallem challenges the mainstream stereotypical representation of Islam and Muslims as backward, fanatical, and premodern by showing how Islamic nationalism and fundamentalism are by-products of modernity. 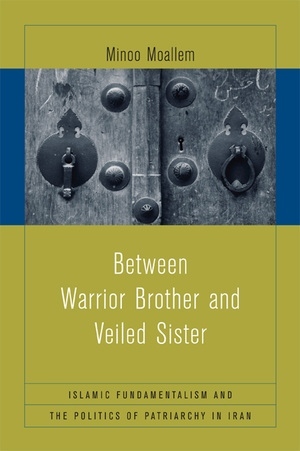 Writing with a deep personal and scholarly concern for recent Iranian history, Moallem refers to the gendered notions of brother and sister as keys to understanding the invention of the Islamic ummat as a modern fraternal community. Using magazines, novels, and films, she offers a feminist transnational analysis of contemporary Iranian culture that questions dominant binaries of modern and traditional, West and East, secular and religious, and civilized and barbaric. Between Warrior Brother and Veiled Sister responds to a number of important questions raised in connection with 9/11. The author considers how veiling intersects with other identity markers in nation-state building and modern formations of gendered citizenship. She shows how Islamic nationalism and fundamentalism are fed by a hybrid blend of images and myths of both pre-Islamic and Islamic Iran, as well as globally circulated patriarchal ideologies. Minoo Moallem is Professor and Chair of Women Studies at San Francisco State University. She is the coeditor of Between Women and Nation: Transnational Feminisms and the State (1999). "This is a stunning and original book. It will intervene in existing fields and discourses to change the way Islamic fundamentalism is viewed in the West. "—Caren Kaplan, Associate Professor of Women and Gender Studies and Chair of Cultural Studies at the University of California Davis. "Between Warrior Brother and Veiled Sister is an original and venturesome piece of work. It is daring in its willingness to test just how far the definition of 'fundamentalism' might be extended in contemporary Iran. It sketches lucidly the gendered crises of identity that have emerged there in the wake of colonization/Europeanization and decolonization. "—Parama Roy, Associate Professor of English at UC Riverside, author of Indian Traffic: Identities in Question in Colonial and Postcolonial India.